Please note: Tampereen Teatteri invited me to see Sugar for free. 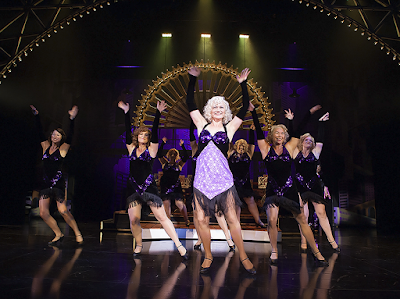 Sugar the musical is based on the brilliant comedy film Some Like It Hot. 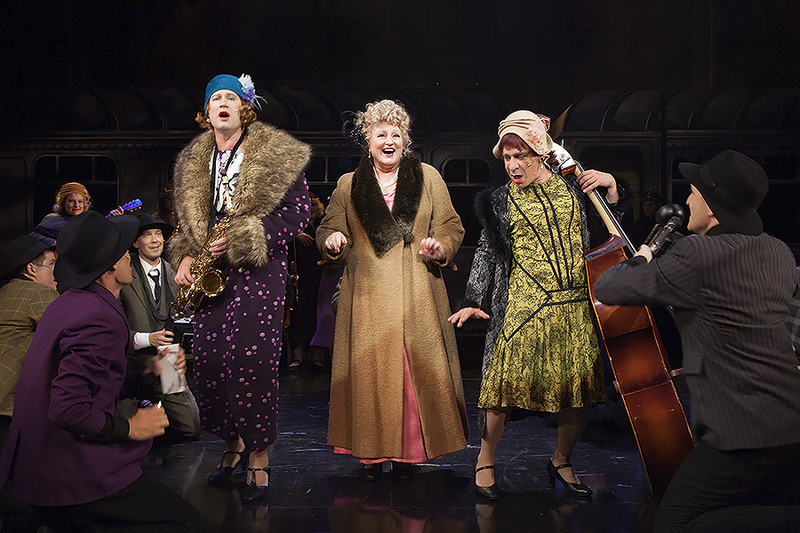 The new Finnish production of the show delivers laugh-out-loud moments in the style of the movie, but as a musical, it's not of an especially memorable sort. I really enjoy the movie, and the musical made me smile, too. But there is one major problem. To understand that, let's compare Sugar with another movie-turned-musical, Rocky. I fell in love with Rocky the musical because of the spectacle, but the more I listen to it, the more I appreciate the music. The songs give the movie's short-spoken characters a change to reveal their inner thoughts, so the audience gets to know Rocky and Adrian better. I'm sure people who know the film by heart will still find something new in the musical. In Sugar, then, the songs are unnecessary. The tunes by Bob Merrill and Jule Styne halt the action without offering any new insights into the well-known story, or being especially catchy either. You could remove the music from the musical without it making much of a difference. You're left wondering if the musical would've worked better as a straight play. Shame about that... But luckily, Tampereen Teatteri's production of Sugar, directed by Georg Malvius (familiar to long-time readers of this blog as the mastermind behind several amazing productions of Les Misérables), does many other things well. 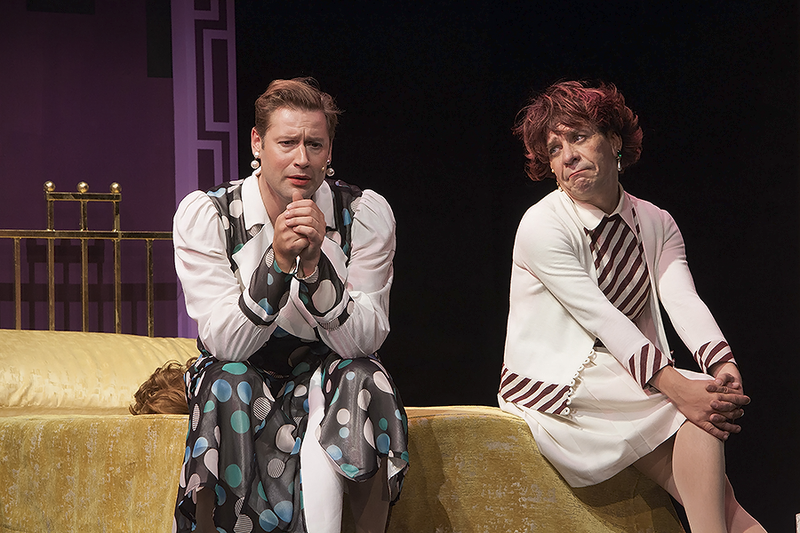 First of all, two thumbs up for the leading duo, Lari Halme as Joe/Josephine and Risto Korhonen as Jerry/Daphne. Both have their fair share of brilliant moments... but as other reviewers have already pointed out, Korhonen's Daphne steals the show. In her Finnish review, Laura speculates that Daphne is to Jerry what Hyde is to Jekyll: a part of the man's personality that he's kept hidden thus far, but once he sets it free, cannot control or suppress anymore. Indeed! Korhonen's Jerry truely – in an over-the-top manner, but oftentimes rather hilariously – gets in touch with his inner feminity. Go Daphne! Helena Rängman is lovely in the titular role, but the role itself is rather two-dimensional. Rängman sings well and looks appropriately Marilyn-esque, but since Sugar's only ambition is to marry rich, the character does not leave much of an impression. The ensemble is full of talent. I especially enjoyed the step-dancing gangster gang, choreographed by Adrienne Åbjörn and lead by suave mafioso Teemu Korjuslommi. I think Spats Palazzo and his team of dancing gangsters could have a couple of scenes more just for the heck of it, they are so much fun to watch. Though actually, apart from the dragging songs, the show is fun to watch from beginning to end. Based on a 1959 movie, Sugar's comedy stems from gender stereotypes. Some of the thoughts featured in the musical are starting to get old-fashioned. The characters for example claim boys cannot marry boys, but luckily, that attitude is losing ground in today's world. Overall, however, the comedy holds up surprisingly well. It's not just laughing at men wearing dresses, it's also about the guys finding out first-hand how men and women are treated differently and are expected to behave. Sugar is a rather popular musical in Finland. It's been produced professionally 15 times. Tampereen Teatteri first did it in the 80s, and back then it became the theatre's most popular production ever. Wonder what becomes of this new production... In the performance I saw at least, the audience a great time. I think all of us held our breaths during the final scene, in anticipation of the legendary final line. By the way, if some international theatre fan reading this happens to be planning a trip to Finland, Sugar is subtitled into English. You can follow the subtitles if you pick a seat on the last five rows of the stalls. So, Sugar in short: thumbs down for the superfluous songs, but recommended for the comedy. Not something I'd see again, but an entertaining performance nevertheless. Suomeksi samasta aiheesta Katrin, Lauran ja Tallen blogeissa. Kiitos taas monipuolisesta arviosta! Me vielä suunnitellaan että lähteäkö tuplamusikaalimatkalla Tampereelle eli tämä + Desirée, tässä olisi toisaalta tuttu ensemblessa joten katsotaan. Kiva tämä olisi kyllä nähdä!